To enhance your online shopping experience with us, we offer various online and offline payment method, from credit card to Internet banking transfer, Easy and Secure! Note: Overseas customer please select PayPal as online payment gateway. For the moment, MOLPay only open for Malaysia, Singapore, Australia, United Kingdom, Hong Kong & Taiwan Credit Card. Otherwise your order will consider cancelled. 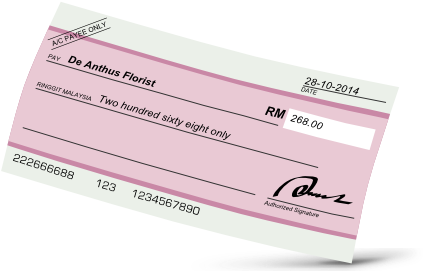 Email your payment receipt to order@deanthus.com, attached with your Name and Order ID. WhatsApp your payment receipt image to +60 16-2103 103, write together with your Name and Order ID. The safer & easier way for overseas customer to pay online - accepts Visa, MasterCard and American Express - Step by Step Guide. Please make crossed cheque payable to De Anthus Florist and Bank in to our Maybank Account 512222113923. As proof of payment, please reply to order@deanthus.com with the scan copy / photo of payment receipt attached.